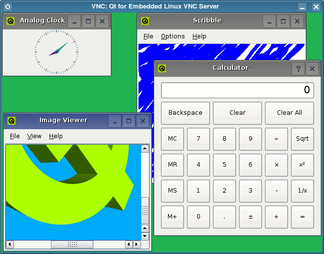 VNC (Virtual Network Computing) software makes it possible to view and interact with one computer (the "server") from any other computer or mobile device (the "viewer") anywhere on a network. VNC clients are available for a vast array of display systems, including X11, Mac OS X and Windows. The application will act as a VNC server which can be accessed using an ordinary VNC client, either on the development machine or from a different machine on a network. To interact with the application from another machine on the network, run a VNC client pointing to the machine that is running the server application. Qt for Embedded Linux will create a 640 by 480 pixel display by default. Alternatively, the QWS_SIZE environment variable can be used to set another size; e.g., QWS_SIZE=240x320. If you want to run more than one application on the same display, you only need to start the first one as a server application, using the -qws command line option to indicate that it will manage other windows. Subsequent client applications can be started without the -qws option, but will each require the same -display option and argument as those used for the server. However, for the clients, this option will not cause a new VNC server to be started, but only indicates that their windows will appear on the virtual screen managed by the server application. It is not always necessary to specify the -qws command line option when running a server application as long as the QApplication object used by the application has been constructed with the QApplication::GuiServer flag. See the running applications documentation for more details about server and client applications. The virtual framebuffer is an alternative technique recommended for development and debugging purposes. 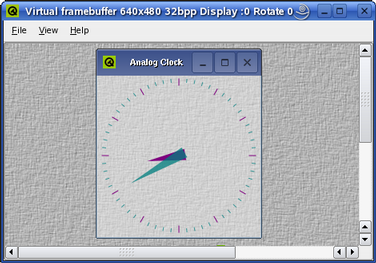 The virtual framebuffer emulates a framebuffer using a shared memory region and the qvfb tool to display the framebuffer in a window. Its use of shared memory makes the virtual framebuffer much faster and smoother than using the VNC protocol, but it does not operate over a network.